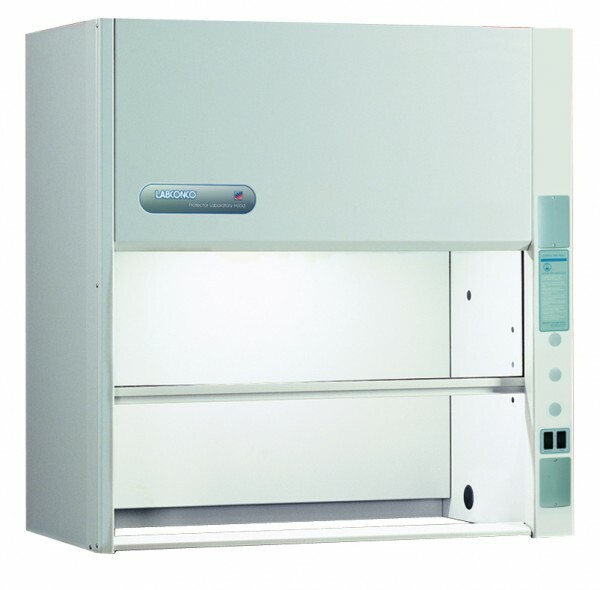 Multiple organizations have adopted laboratory hood safety standards to determine the effectiveness of a hood in limiting occupational exposure. One such measure of determining the effectiveness of the hood is by measuring the speed of air entering the hood (i.e. the face velocity). While face velocity is not the only test method for determining if a hood has the ability to adequately contain the contaminants (see ANSI/ASHRAE 110-1995 Method of Testing Performance of Laboratory Fume Hoods), it is the only performance standard cited by the following organizations. The National Institute for Occupational Safety and Health (NIOSH) Alert: Preventing Occupational Exposures to Antineoplastic and Other Hazardous Drugs in Health Care Settings was published in September 2004. 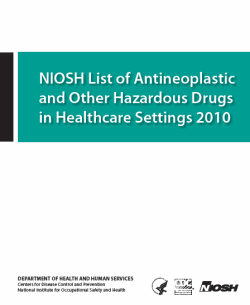 In Appendix A of the Alert, NIOSH identified a sample list of major hazardous drugs. The list was compiled from infor-mation provided by four institutions that have generated lists of hazardous drugs for their respec-tive facilities and by the Pharmaceutical Research and Manufacturers of America (PhRMA) from the American Hospital Formulary Service Drug Information (AHFS DI) monographs. This update adds 21 drugs to the original list in the 2004 Alert. These additions are new drugs or existing drugs that had new warnings from 2004 to 2007. To download a copy of this document, click HERE (). Much in the same way that OSHA offers free onsite health and safety consulting services, NIOSH has a similar program for workplaces. A Health Hazard Evaluation (HHE), offered by NIOSH, is a study of hazardous materials or harmful conditions in the workplace. Taking the form of an interview, site visit and evaluation, or helpful information, the HHE provides the NIOSH findings and/or recommendations to the employer in the effort to reduce the hazard of issue. To request a NIOSH HHE, click HERE. Employees have an illness from an unknown cause. Employees are exposed to an agent or working condition that is not regulated by OSHA. Employees experience adverse health effects from exposure to a regulated or unregulated agent or working condition, even though the permissible exposure limit is not being exceeded. Medical or epidemiological investigations are needed to evaluate the hazard. The incidence of a particular disease or injury is higher than expected in a group of employees. The exposure is to a new or previously unrecognized hazard. The hazard seems to result from the combined effects of several agents. assistance in recognizing hazards in your workplace. suggestions or options for correcting safety and health issues. assistance in developing or maintaining an effective safety and health program. to reduce workers compensation cost and improve employee morale..
is delivered by state (and territorial) governments using well-trained safety and health professionals. is confidential. The company’s name, and any other identifying information provided about the workplace, plus any unsafe or unhealthful working conditions that the consultant uncovers, will not routinely be reported to OSHA enforcement personnel. does not issue and citations, penalties, or fines. will provide you a confidential, written report that summarizes the consultant’s findings. requires the correction of hazards identified by the consultant(s). under specific circumstances, employers with exemplary safety and health programs can be recommend for recognition and provided with an exclusion from general schedule inspections.
. 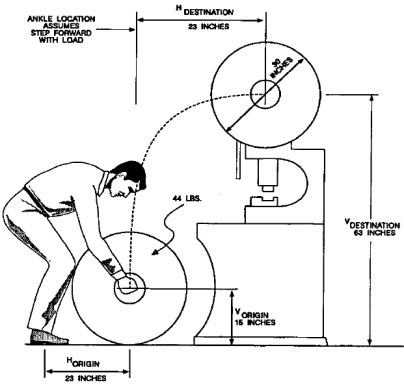 If you are unfamiliar with the NIOSH Lifting Equation, a good resource is the Revised NIOSH Lifting Equation Document. The Wall Street Journal has written an article based upon findings of the National Institute for Occupational Safety and Health (NIOSH) indicating a rise in the occurrences of black lung in miners. Based upon the findings of NIOSH, approximately 9% of miners with 25+ years of experience were positive for black lung in 2005 and 2006, which represents a doubling of the percentage of those with black lung in the 1990’s. Black lung is serious health and safety issue in mines, even more so than mine accidents, with more than 10,000 dead since 2000, versus less than 400 from mine accidents. New monitoring equipment may be potentially introduced by MSHA (Mine Safety and Health Administration) to allow real-time, continuous monitoring of an employee’s dust exposure, versus the standard 8-hour periodic exposure monitoring. 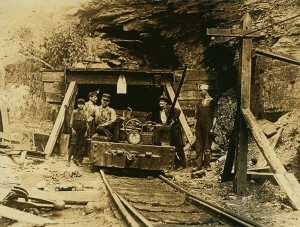 The real-time monitoring would also take into account longer work shifts, which is quite common in the mining industry. Online Tool: Is Your Hearing Protection Providing Adequate Attenuation? An extremely useful field tool to determine if you are achieving adequate attenuation with your hearing protection has been devised by NIOSH. Have you used this in your workplace? How successful has it been? Let us know in the comments section of this post. Loud noise can permanently damage your hearing. It especially affects the sounds that help you understand speech. Earmuffs, earplugs, and other hearing protection devices can reduce your risk of hearing loss, but only if you get a good fit and wear them properly. Follow the instructions for the sound player on the right side of this page to perform a quick test of whether you are getting at least a minimal 15 decibel (dB) level of protection. The test sounds are bands of random noise with a center frequency of 1000 Hz. 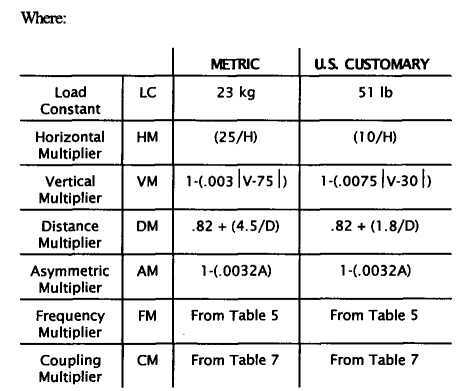 This is the same type of sound used in standard hearing protector ratings including the “American National Standard Methods for Measuring the Real-Ear Attenuation of Hearing Protectors” (ANSI S12.6). Both tracks are the same, but the second track is 15 decibels (dB) louder than the first. Most hearing protectors will block or “attenuate” sound by more than 15 dB if they are the right size and shape to fit your ears and are worn correctly. A sound that is barely audible at your threshold of hearing without hearing protection should be inaudible though hearing protection even if it’s boosted by 15 dB. For online testing, click the links, goto the .mp3 page, then click the file. Quicktime (or the program you have installed on your computer) will play the file. To download the files for offline testing, right-click the link and choose “Save File As…” or similar selection from the menu. The Environmental Protection Agency hosted over 300 spray foam industry professionals and concerned viewers in an online seminar to introduce the agencies’ collective concerns and involvement with the safety practices and health risks associated with the handling, application, and life cycle usage of spray polyurethane foam. The SPFA reports market growth of up to 40% since 2004. The EPA sited a report indicating that over 400 million pounds of polyurethane foam were consumed in North America during 2008. 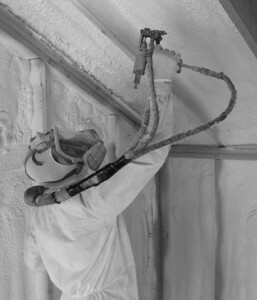 According to information made by the EPA, another webinar will be held regarding Spray Foam due to demand. Stay tuned to OHShub.com for more information. Mary Cushmac, from the EPA opened up the meeting with comments about the current situation in the industry as it relates to the government agency’s perspective. She indicated that both the A-side product and B-side products contain both primary and intermediate chemicals of concern, especially if they are mis-handled, or applied incorrectly. 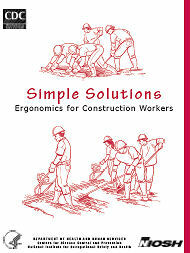 To aid in the prevention of these injuries, this booklet suggests many simple and inexpensive ways to make construction tasks easier, more comfortable, and better suited to the needs of the human body. Example of a “simple solution.” This ironworker uses a tool that automatically ties rebar with the pull of a trigger. The extended handle lets him work while standing upright. No leaning, kneeling, stooping, or hand twisting are necessary. Construction is one of the most hazardous industries in the United States. The number of back injuries in U.S. construction was 50% higher than the average for all other U.S. industries in 1999 (CPWR, 2002). Backaches and pain in the shoulders, neck, arms, and hands were the most common symptoms reported by construction workers in one study (Cook et al, 1996). Material handling incidents account for 32% of workers’ compensation claims in construction, and 25% of the cost of all claims. The average cost per claim is $9,240 (CNA, 2000). Musculoskeletal injuries can cause temporary or even permanent disability, which can affect the worker’s earnings and the contractor’s profits. 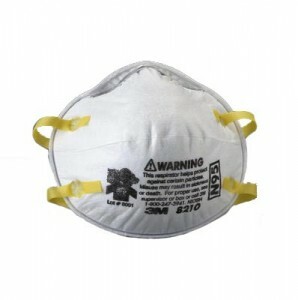 The N95 respirator is the most common of the seven types of particulate filtering facepiece respirators. This product filters at least 95% of airborne particles but is not resistant to oil. N95 Filters at least 95% of airborne particles. Not resistant to oil. N99 Filters at least 99% of airborne particles. Not resistant to oil. In 2008 more than 145 million people in the U.S. were employed in the civilian workforce. Every day, approximately 9,000 workers are injured on the job and 15 workers die from a fatal workplace injury. Work-related illness claims the lives of about another 135 workers and retirees daily. According to the Bureau of Labor Statistics (bls), 5,657 workers died from work-related injuries and more than 4 million nonfatal injuries and illnesses were reported in 2007. The economic impact of work-related injury and illness has been estimated to be $171 billion annually, the same as cancer or cardiovascular disease and much greater than the burden from hiv/aids or Alzheimer’s disease. In 2006 employers spent an estimated $87.6 billion on wage payments and medical care for workers hurt on the job. 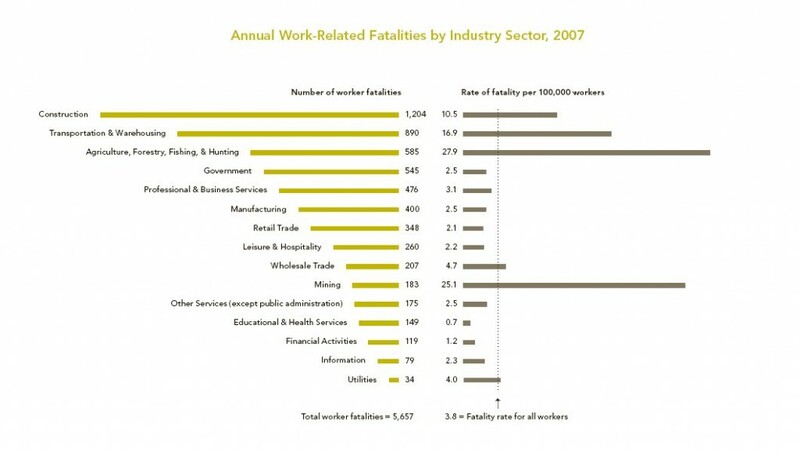 Addressing workplace safety and health poses numerous challenges. First, the composition of the U.S. workforce is becoming increasingly diverse; it is becoming older, more racially and ethnically diverse, and more women are entering the workforce. These changes reflect the changing social and demographic characteristics of the country but also produce new safety and health issues. It has become clear that certain populations experience an increased burden of disease, disability, and death. These populations also frequently have less access to quality healthcare. Moreover, U.S. workplaces are rapidly evolving, changing the way work is organized. Jobs in our economy continue to shift from manufacturing to services, with service-providing industries now employing about 80 percent of all workers. Longer hours, compressed work weeks, shift work, reduced job security, and part-time and temporary work are realities of the modern workplace and are increasingly affecting the health and well-being of workers and their families. In addition, new chemicals, materials, processes, and equipment with new potential occupational risks are being developed and marketed at an ever-accelerating pace. The acute and long-term effects of work-related injury, illness, and death translate into tremendous economic and emotional costs to society. Data show that when interventions, such as safe work practices and engineering controls, are based on sound scientific research the burden of injury and illness is significantly reduced. Through its Research-to-Practice (r2p) initiative, niosh works closely with its partners to move research findings and technologies out of the Institute and into the workplace, and to promote the diffusion of products and information in an effort to protect workers and reduce cost to employers, workers, their families, and society as a whole. Dangerous Decisions LLC today is proud to introduce the NIOSH Pocket Guide 1.0, their new chemical hazards database for iPhone and iPod touch. 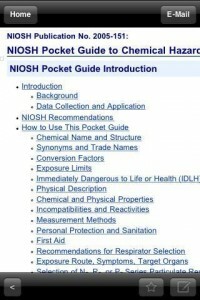 Designed specifically to take advantage of the iPhone’s interface, the NIOSH Pocket Guide (National Institute for Occupational Safety and Health) gives safety professionals immediate access to crucial information on all of 677 chemicals in the database including all the resources of the NIOSH Pocket Guide and much more. The NIOSH Pocket Guide to Chemical Hazards (NPG) is intended as a source of general industrial hygiene information on several hundred chemicals (with their classes) for workers, employers, and occupational health professionals. It is a must-have for every safety professional, industrial hygienist, chemist, or collage student seeking a safety degree, and a valuable reference guide for anyone that works with hazardous chemicals in the workplace or at home. The information found in the NIOSH Pocket Guide help users recognize and control occupational chemical hazards. The NPG does not contain an analysis of all pertinent data. Rather, it presents key information and data in abbreviated or tabular form for chemicals or substance groupings (e.g. cyanides, fluorides, manganese compounds) that are found in the work environment. 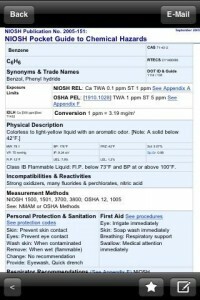 Designed as a stand-alone application, the Pocket Guide includes the chemical names, synonyms, trade names, conversion factors, CAS, RTECS, and DOT numbers, recommended exposure limits (NIOSH RELs), Occupational Safety and Health Administration (OSHA) Permissible Exposure Limits (PELs), and NIOSH Immediate Dangerous to Life and Health values (NIOSH IDLHs) (documentation for those values). The guide also features a physical description of the agent with chemical and physical properties, measurement methods, personal protection and sanitation recommendations, respirator recommendations, as well as great information on health hazards including route, symptoms, first aid and target organ information. NIOSH Pocket Guide 1.0 is only $9.99 (USD) and available exclusively through the App Store in the Reference category. Free updates as Chemical exposures recommendations change will be made available. Review copies are available upon request. “Concerns have been raised about whether workers exposed to engineered nanoparticles are at increased risk of adverse health effects. The current body of evidence about the possible health risks of occupational exposure to engineered nanoparticles is quite small. While there is increasing evidence to indicate that exposure to some engineered nanoparticles can cause adverse health effects in laboratory animals, no health studies of workers exposed to the few engineered nanoparticles tested in animals have been published. The purpose of this document from the National Institute for Occupational Safety and Health (NIOSH) is to provide interim guidance about whether specific medical screening, including performing medical tests on asymptomatic workers, is appropriate for these workers. Medical screening is only one part of what should be considered a complete safety and health management program. An ideal safety and health management program follows a hierarchy of controls and involves various occupational health surveillance measures. Since specific medical screening of asymptomatic workers exposed to engineered nanoparticles has not been extensively discussed in the scientific literature, this document makes recommendations based upon what is known until more rigorous research can be performed. Currently there is insufficient scientific and medical evidence to recommend the specific medical screening of workers potentially exposed to engineered nanoparticles. Nonetheless, this lack of evidence does not preclude specific medical screening by employers interested in taking precautions beyond existing industrial hygiene measures. If nanoparticles are composed of a chemical or bulk material for which medical screening recommendations exist, these same screening recommendations would be applicable for workers exposed to engineered nanoparticles as well. * Take prudent measures to control exposures to engineered nanoparticles. * Conduct hazard surveillance as the basis for implementing controls. * Continue use of established medical surveillance approaches.